This chapter summarizes the empirical findings by case and compares them to the original research design based on the relationship between jus soli and territorial integrity concerns. It then discusses the implications for existing academic debates, policy-making and suggests a future research agenda. Makaryan, Shushanik. 2009. 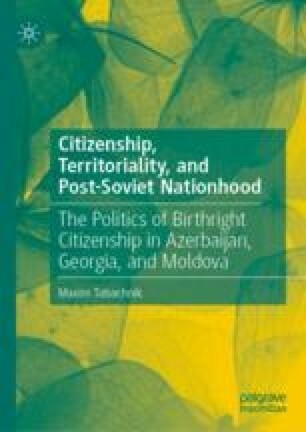 State-Building and Nation-Making in the Former Soviet Republics: Transformation and Institutionalization of Citizenship, 1990–2005. Washington State University. http://www.dissertations.wsu.edu/Dissertations/Summer2009/s_makaryan_070709.pdf, accessed November 19, 2018. Umland, Andreas. 2008. A Shield of a Passport: Moscow Uses Russian Citizenship as a Tool for Recollecting the Empire’s Lands. Russia Profile. www.russiaprofile.org.